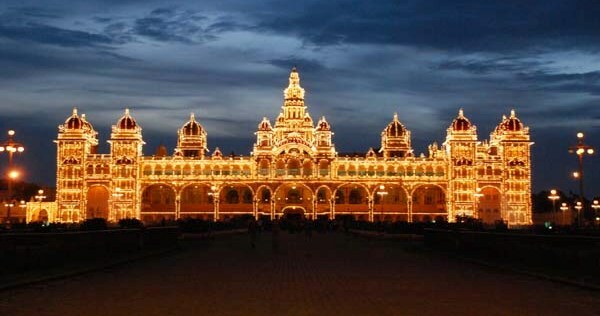 Mysore Palace is a historical palace located in the heart of the city. It is most visited place of Mysore and one of the most famous and visited place of India after Taj Mahal. It receives more than 60 lac visitors annually (6 Million). It is located near to Mysore Zoo and Mysore Palace to Mysore Zoo distance is 1.5 KM. The original palace was built by King Yaduraya inside the old fort and it was built in the 14th century. It was demolished and constructed many times in the past. Current palace construction was begun in 1897 and completed in 1912. The architectural style of the palace is Indo-Saracenic. It is a three story structure with a 145 foot high five story tower. Mysore Palace timings are from 10 AM to 5.30 PM everyday including Sundays, Saturday, weekdays and weekends. The Mysore Palace opening time is 10 AM and closing time is 5.30 PM every day. Mysore Palace lighting timing is 7 PM to 7.30 PM only on Sunday and Public Holidays. Illumination of the Palace is only done on Sundays and Holidays. Average time to visit the palace is 2 to 3 hours. Mysore Palace ticket price is affordable for every tourist and visitors. Entry fee for Adults are 40 Rs and Children between 10 to 18 years have to pay 20 Rs for the entry in the palace. Children below 10 years are eligible for free entry. School students in groups have to 10 Rs per student for entry into Palace, however, they need to produce a letter from school management for discounted entry. Photography charges are 20 Rs, however, Mysore palace inside photographs are not allowed to visitors. Foreigner tickets are on the higher side as compared to Indian nationals. Entry fee for foreigners are 200 Rs. and Audio Kit Facility is included in ticket price. An Indian national have to pay extra for Audio Kit. Audio Kit and tickets can be bought from the Mysore Palace ticket counter and it is available in Hindi, English, Kannada, German, Italian, Japanese and French. East Gate, South Entrance, North gate and West Entrance are four main entrances of the palace. Public entry is from the west gate. Sound and Lighting show at Mysore Palace timings are 7 PM to 7.45 PM every day except Sunday and Government holidays. Ticket prices are 40 Rs for Adults and 25 Rs for children of 7 to 12 years of Age. Kids under 7 years are eligible for the free show. Palace is located in the heart of city and it is located very near to Mysore railway station. Mysore Palace to Mysore Railway Station distance is just 2 KM. City buses, cab and auto cabs can be used to reach here. Many facilities are available inside the palace for the convenience of visitors. Mysore Palace is a must visit palace of Mysore and it must be visited by tourists if they are in Mysore. Tourist should also visit Mysore Zoo which is just 1.5 KM from here. It is good place to experience seekers, photo fanatics and history buffs.